This could be a bumper year for Africa fundraising. ABC looks at five Africa-focused private equity firms. Africa’s stock markets may be underdeveloped and businesses struggle raising capital, but investors are relying on a dependable source of cash and confidence: private equity markets. 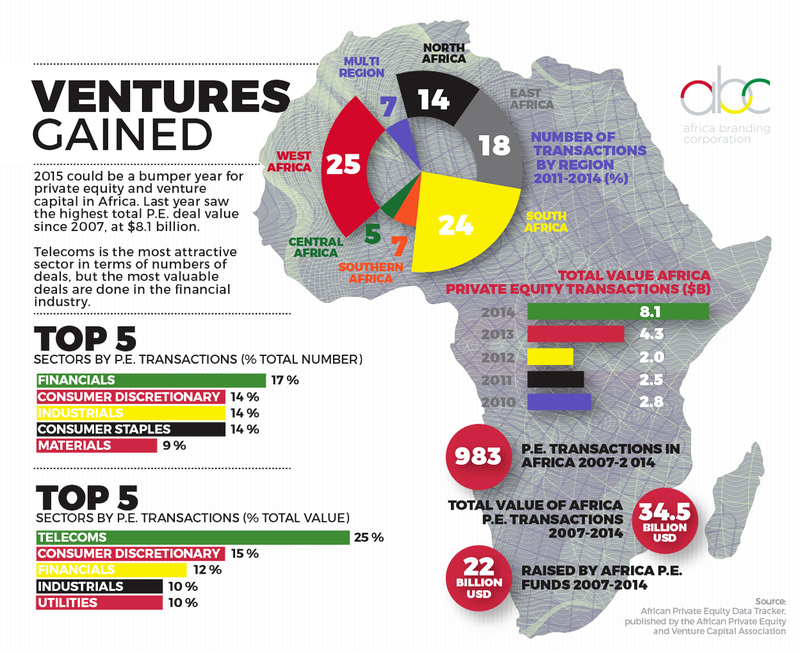 The total deal value for private equity transactions in Africa in 2014 was the second highest on record, according to the African Private Equity and Venture Capital Association. At $8.1 billion, it was almost twice as much as transactions in 2013. The deals are helping to inject cash into sectors that are most ripe for growth. Fast-moving consumer goods (FMCG), for example, accounted for almost two-thirds of all private equity transactions by volume since 2007. Telecommunications services attracted a quarter of the largest investments by value. Between 2007 and 2014, nearly 1,000 private equity transactions were made for a total value of $34.5 billion. Private equity markets will not make much of a dent in Africa’s massive investment shortfalls, especially the $90 billion needed per year for infrastructure development. The sector is short term in nature as private equity managers typically seek to flip their investments within five years of acquisition. The continent will need long-term investment solutions for bigger needs like electricity, infrastructure and transportation. Using market data from Asoko Insight, Africa’s reference provider of corporate data, ABC looks at five Africa-focused private equity firms. Last year the Carlyle Group closed its maiden fund for Africa, the Carlyle Sub-Saharan Africa Fund, at $698 million – 40 percent above target. Total investments will be allocated to opportunities in South Africa, Nigeria, Kenya, Tanzania, Ghana, Mozambique, Botswana, Zambia and Uganda. Last August, Carlyle announced the fund’s two first deals, the first being an 18 percent stake in Diamond Bank, a Nigerian lender with a reported value of $147 million. The most salient feature of the fund is that half of contributions came from first time investors in Africa. As these new entrants begin to enjoy consistent returns, this will bode well for Africa’s overall private equity market. Adding an established player like Carlyle to the fold gives the sector major credibility. Founded by two Nigerian-born dealmakers, Helios raised a record oversubscribed $1.1 billion for its Africa-focused fund in February 2015. This is the company’s third fund raised since it was established in 2007. With $3 billion worth of funds under its management, Helios has a broad coverage of African markets and institutions, operating in more than 35 countries on the continent. Its diverse base comprises sovereign wealth funds, pension funds and family offices. In February, Actis announced it was establishing a $1.9 billion pan-African renewable energy platform, Lekela Power, co-managed with Mainstream Renewable Power. Lekela will build 700 MW of wind energy and 900 MW of solar power facilities across Africa. The project has good precedents, as it is modeled after successful renewable partnerships between Actis and Mainstream in Chile and South Africa. Actis is also raising equity for real estate, with a $400 million fund fully dedicated to Sub-Saharan Africa, following the raising of funds in 2006 and 2012. The 2013 winner for PE Fund of the Year was first private equity group with exclusively African investments to raise more than $2 billion. The headline investment was its Africa Fund III, with $930 million in commitments and 32 investments completed. ECP’s broad success across multiple sectors – natural resources, agriculture, telecommunications – is a strong validation of the positive investment trends in Africa and a benchmark for ongoing growth in private equity. With 14 funds under management worth $1 billion, AfricInvest has a well-balanced portfolio across 112 investments. The firm’s multi-sector exposure and its approach to growth-capital investments in SMEs demonstrate it is well poised to capitalize on favorable African macro-economic trends. Its growth strategy is based on funding companies that are well-established in their local markets. Its AF III, which closed at €154 million last October with investments in FMCG, telecoms and energy, is a sterling example of how its plans to meet its net return objectives.